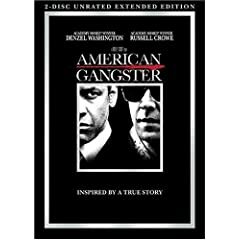 Ridley Scott's American Gangster is the marquee DVD release this week, but I will pass it up in favor of the biopic of Argentinian footballer Diego Maradona, Maradona, The Hand of God. The Criterion Collection releases Walker, Alex Cox's biopic of American adventurer William Walker. Volume 5 of the Burn to Shine live music video series was curated by Death Cab for Cutie and Postal Service member Ben Gibbard, and focuses on Seattle artists. In this unique series, a selection of bands is recorded in a house in one day. Burn to Shine, Vol. 5: Seattle, WA 01.27.07 contains performances by Eddie Vedder, Gibbard, David Bazan, Tiny Vipers, and many more indie acts. Another music DVD worth checking out is Flipper: Live - Target Video 1980-1981, which collects live performance video from the band's original lineup. The 1983 animated feature Rock & Rule also looks interesting, with Lou Reed and Debbie Harry featured on the soundtrack. What new DVDs are you picking up this week? What can you recommend or discourage me from even renting?